The 2016 Dodge Dart is a compact sedan that provides cutting-edge tech features, rich interior comfort, and fuel-efficient performance. Drivers love its spacious, comfortable cabin. Extensive infotainment features keep you connected with the outside world, no matter where you travel. Under the hood, the Dart generates a punchy performance and money-saving fuel mileage. The Dart’s safety gear provides world-class passenger protection. The 2016 Dodge Dart has a reputation for interior comfort and style. Inside, you’ll find plenty of soft-touch surfaces and supportive padding. Both rows supply adult-friendly head- and legroom, so you can settle in for the long haul without a second thought. With leather upholstery, the Dart takes passenger comfort to the next level. During winter, the Dart’s heated front seats ward off the cold. The trunk supplies 13.1 cubic feet of cargo space for your shopping hauls and sports gear. Use the folding rear seat to expand cargo space and stow larger items. You’ll love the 2016 Dodge Dart’s high-tech convenience features. 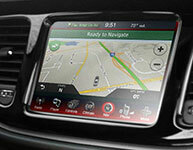 The Uconnect system is your central hub for infotainment options. Its smartphone integration options keep you connected, with features that include hands-free texting and music streaming options. Uconnect also provides voice-control technology, so you can access features without looking away from traffic. Additional entertainment options, like satellite radio, help you get through long commutes. Keyless entry and ignition features help you make a quick getaway. The Alpine sound system supplies world-class audio. 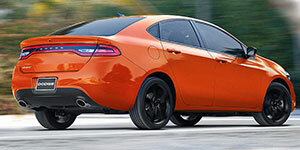 The Dodge Dart supplies the kind of passenger protection you crave. In government crash tests, the Dart earned a perfect five-star rating for overall protection. The Insurance Institute for Highway Safety gave the Dart its top score of “Good.” In addition to excellent crash-test scores, the Dart offers a wide range of high-tech driver aids. As you back out of a parking space, the rear cross-traffic alert system lets you know if any traffic is headed your way. 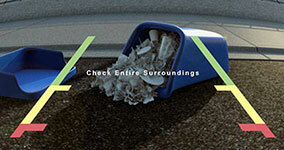 The rearview camera helps you spot any obstacles in your path. Choose from a range of powertrains to create the Dart performance you crave. No matter which options you choose, the Dart combines ample speed with a fuel-efficient performance. Earn up to 28 city/41 highway mpg and save a bundle at the pump. On the road, the Dart feels sharp and responsive. Whether your cruising around tight corners or down winding roads, the Dart inspires complete confidence. With ample power at your fingertips, you’ll get up to speed in a snap. The 2016 Dodge Dart Limited takes comfort and tech features to the max. The Limited’s sunroof gives the cabin an open, airy feel. The perforated leather upholstery creates long-term passenger comfort and support. Chrome exterior trim sets the Limited apart from other models. The Dart’s powertrain provides a shot of pure adrenaline. The Dart travels up to 541 miles on one tank of gas. Spot any obstacles in your path. Access real-time traffic and weather updates and turn-by-turn navigation features. When you crave high-tech infotainment features and fuel-efficient performance, the 2016 Dodge Dart delivers. It’s also a great pick for drivers looking for sharp handling and a comfortable ride. Inside, the Dart provides substantial passenger comfort. The Uconnect system keeps you connected with smartphone integration features and real-time traffic reports. High-tech safety gear speaks to your need for protection and driver assistance. Take the Dart on a test drive today!